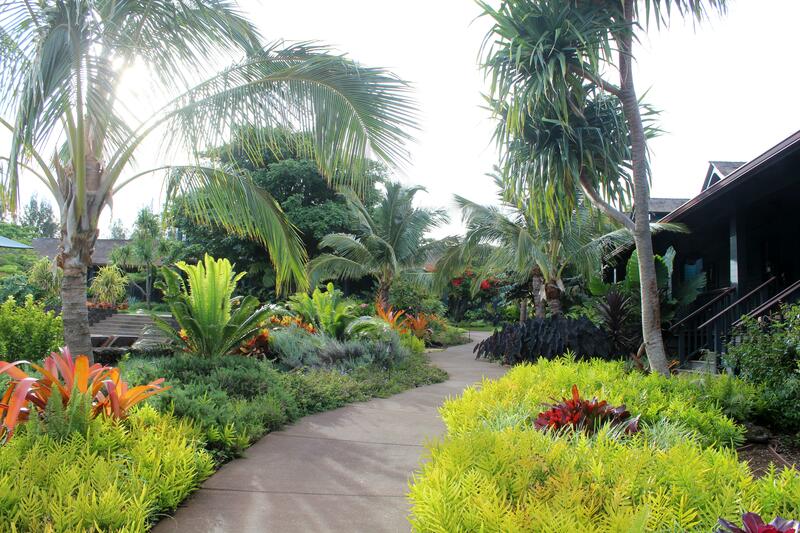 Lumeria Maui is amazing, there is really no other way to describe it. Lumeria is the whole reason that we got to go to Maui because my little sister won a 3 night/4 day stay at the resort. I highly suggest everything about Lumeria; staying there, practicing yoga there, and dining there. 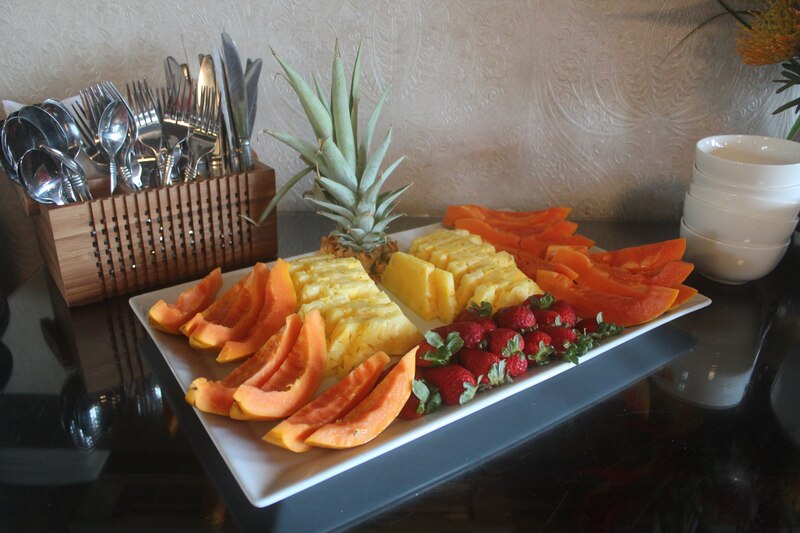 Every morning Lumeria has breakfast available to their guests which consists of fresh fruit, oatmeal, gluten free and regular toast, freshly baked muffins, hard boiled eggs, yogurt, granola, juice, and freshly flavored water (with mint, citrus, etc). We looked forward to breakfast every morning, it was so delicious. Lumeria Maui also offers dinner every night at a fixed price per person, and the menu changes daily based on the fresh catch or protein of the day. We were lucky enough to have two seafood courses at our dinner on Saturday night. 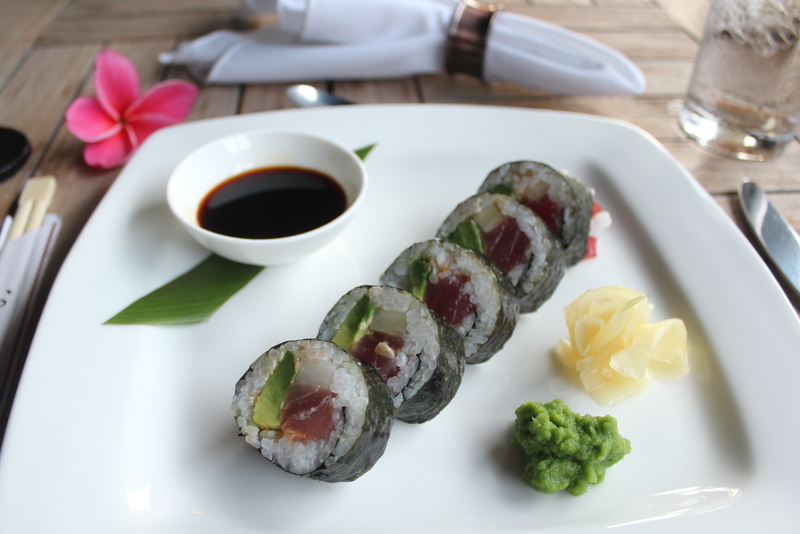 Our first course was a fresh, mildly spicy ahi tuna sushi roll with avocado and heirloom carrot that was just bursting with flavor. 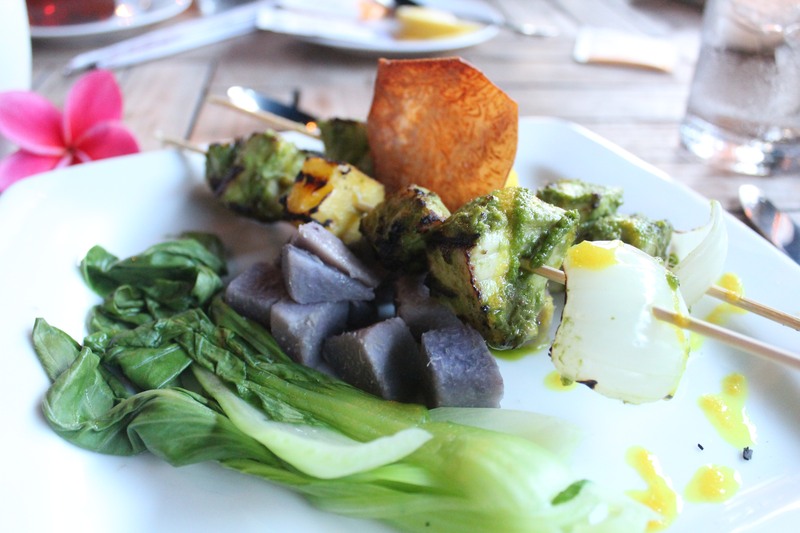 Our second course was a grilled exotic spice-rubbed kabob of freshly caught fish, pineapple and onion with steamed bok choy and taro root on the side. 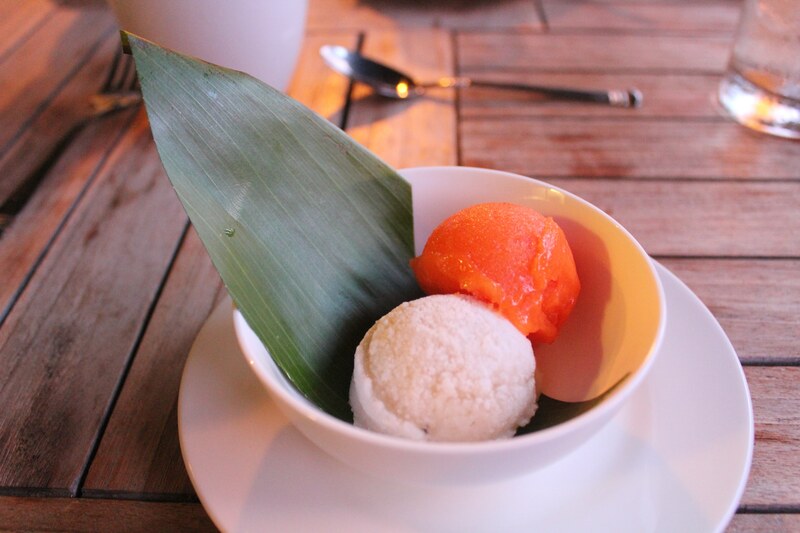 Finally, our third dish was a duo of sorbets; sour sap and papaya. Everything was fresh and bright and enticing, it was a true taste of Hawaii. I really love poke, but this was the first time that I have ever had real Hawaiian Poke. I found Like Poke through a Sunset Magazine article about Maui. I always skipped those sections in Sunset, thinking I would never get to go to Maui. I was excited to dig up all of my old magazines to see where Sunset suggested to go, and I am so glad I did! Sunset never steers you wrong. As my sister Sarah said, “it was so good, you can’t even describe it. 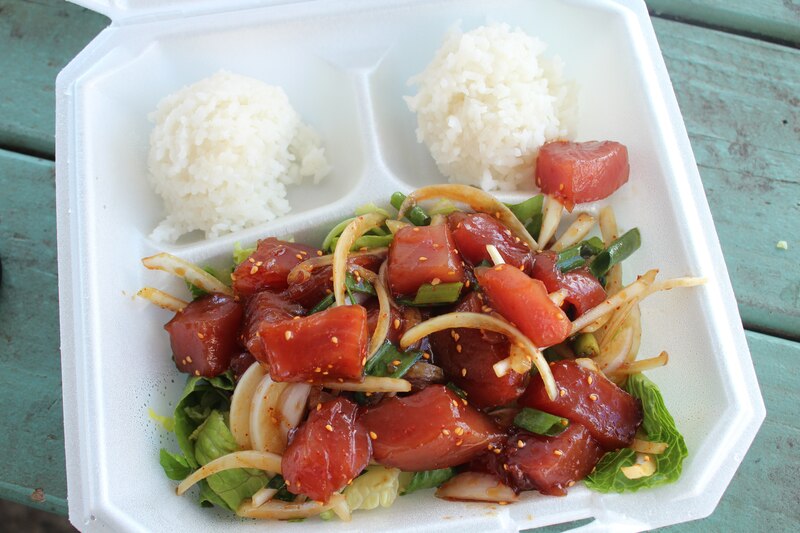 The flavors were the perfect mix of sweet and salty, and the fish was really tender.” We don’t like poke, we love it! Maybe they should rename… Like Poke has many different dishes, and all of them feature freshly caught fish and handmade sauces. The traditional Poke has a shoyu sauce, but Like Poke also offers a spicy, ginger, and wasabi versions with options to mix the flavors together. All three of us ordered the ginger wasabi shoyu poke, which is what was featured in Sunset Magazine. The flavors were fresh and amazing and the fish was sublime, with generous sized pieces. The poke was served with two scoops of rice and the fish was on a bed of greens. I highly recommend seeking out this food truck; it is in a nondescript, industrial area and you would have to be looking for it to find it. We ate there on our last day on the way to the airport, and we automatically wished that we ate there EVERY day during our stay in Maui. Get there early, some reviews say that they often run out of poke quite early. We spent the day at Big Beach and Little Beach, and asked a local for a good sushi place to stop at on our way back to Lumeria. Three’s did not disappoint. We got there just in time for happy hour, the only downfall of which is that we had to sit at the bar, but thankfully the sushi made up for it. We ordered Coconut Crusted Shrimp (two orders, because it was so good), Panko Crusted Ahi Roll, Spicy Tuna Roll and a Salmon Avocado Roll. Everything was a steal at happy hour prices, and the rolls were stuffed with the freshest fish. Unfortunately we were too tired and hungry to pause to take a picture, but if you are in the area this is one place that you don’t want to skip! It is surrounded by quaint boutiques as well, so it might be a good area to shop. Locals and Sunset Magazine suggested dining at both Flatbread Company and Mana Foods, so we couldn’t skip them! Flatbread pizza has the best gluten free pizza crust that I have ever had. We ordered the Mediterranean pizza with gluten free crust and a side of garlic oil, as instructed by some locals that we met on the beach. It was amazing! The flavors were so bright, which is a common pattern among food in Maui. On our long trip to the Westin Maui, this flatbread was heavenly and gratifying, laden with tomatoes, spinach, kalamata olives, pepperocinis, feta cheese, and other tasty toppings. We loved Flatbread and I wish there was a location in Phoenix. Mana Foods is the mecca of grocery markets for Whole Foods and natural market lovers. It has an unorthodox layout that suggests that the building was once a home, not a store. It has various sections for produce, packaged foods, vitamins, a deli, select kitchen and home goods, coffee, and an entire wall of chocolate. I don’t think we saw the whole store, so I’m sure there’s even more than that. We picked up goat cheese, rice crackers, local avocados, kombucha and Kevita, gluten free bread and pretzels, and curry chicken salad from the deli. They seemed to have pretty reasonable prices on most items and it was a fun place to shop. Mana Foods has a wide selection of grocery items that can be a little more difficult to find in Phoenix, which makes me jealous of Paia residents who get to shop there on a regular basis. This is the perfect place to stop for beach or travel snacks, or a quick bite on the go. Our stay at the Westin, Maui was short but oh so sweet. The view from our room was gorgeous and the hotel itself is breathtakingly beautiful. Unfortunately (so unfortunately), I didn’t get to see the beach here, but we did get to experience the Westin’s Luau. 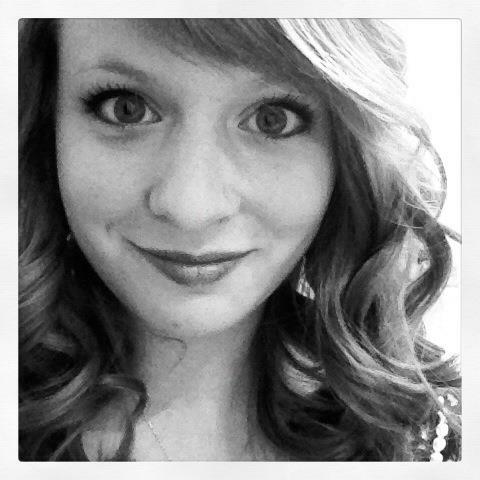 The Luau was fun and the food was delicious, although it was my first Luau so I don’t have anything to compare it to. Here is a picture of a plate with a little bit of everything: The menu consisted of two different poke-style salads, one with salt-cured salmon and the other with cooked beef; cucumber salad; hawaiian purple sweet potatoes with toasted coconut; slow-roasted pork; teriyaki BBQ chicken; steamed ono with spices and fresh tomato relish, fresh greens with three salad dressings, my favorite of which was a lavender vinaigrette (of course) that I now need to re-create; traditional Hawaiian macaroni potato salad; poi; fresh pineapple and papaya; and lo mein. The steamed ono was my favorite thing on the entire buffet, and I went back for seconds. In addition, we loved the cucumber salad, lo mein, teriyaki BBQ chicken and the lavender salad dressing. They also served multiple mini desserts on a second buffet along with hot coffee and tea, unlimited various cocktails and flavored water, all of which were included in the price. They gave me a lovely fresh fruit plate since most of the desserts were not gluten free. The show was fun and the sunset was beautiful. It was a wonderful experience. Everyone loves gelato, and after dinner at Paia Fish Market, it was just what we wanted! They had a deal on a pint with three different flavors, so we chose macadamia nut, chocolate mint and sandy beach, which was peanut butter flavored gelato. The gelato was luscious, perfectly sweet and rich. In addition to gelato, the Ono Gelato Company also sells Jeff’s Jams and Jellies, jewelry and other small souvenirs. It was the best price that we found for Jeff’s Jams and Jellies, so we bought a few jars to bring back for friends. The Jawz Fish Tacos food truck was conveniently located in the parking lot at Big Beach. We ordered an XL (the size of 3 street tacos) fish taco, a fresh fruit smoothie, and a natural lemonade shaved ice. Everything was so fresh (I keep repeating that word, but it’s true; everything in Maui tastes SO fresh! ); the flavors were bright and zesty, and the salsas added quite a kick of heat! The smoothie was incredible and you could see that they used real fruit to make it, which we appreciated. I highly recommend stopping here if you pass the food truck! Da Kitchen was our first stop after arriving in Maui, hungry from our travels. It was recommended to us by an airport employee. We ordered the Garden Salad with papaya seed dressing and Honolulu Style Fried Noodles. My sister is still raving about the noodles, which I tasted a small bite of and thought they were very good. I loved the salad and felt that it was the perfect burst of freshness that I needed after our long trip to Maui. Big Beach BBQ is a small food truck that we saw along the side of the road. It would have been easy to pass, but in the spirit of spontaneous travel we stopped to see what they had to offer. We were greeted with a tempting menu of fish tacos, pulled pork tacos, pulled pork sliders, and various sides. We ordered one of each taco to split, which was a nice little snack for the road. Definitely stop here if you see it! It would be easy to pass by, but you’ll regret it. The tacos were so mouth-watering and perfect. They also seem to grow some herbs and peppers too, as there was a small garden next to the food truck. The Twin Falls is the first stop on the road to Hana when leaving from Paia. It is a bit of a hike to and from the nearest of the two falls, so when we got back to the entrance we were ready for something refreshing. The fruit stand sells bananas, coconuts (both to drink and to eat), pineapple, coconut chips, and other goodies. We bought a coconut to drink, and the stand employees expertly chopped the top off and stuck two straws inside. Once we were done sipping on the coconut juices, they offered to cut the coconut open so that we could scoop out the soft fleshy part. If you have never drank from a coconut, or enjoyed a young coconut, you definitely have to while you are in Maui. Don’t skip the pineapple or bananas either! The Paia Fish Market was recommended, like many other places, by both locals and Sunset Magazine. We all ordered Fish Tacos. I liked that the tacos were stuffed with fresh fish, but I wasn’t crazy about the sides. They also have fresh fish that you can get cooked to order however you like, and I wish I had splurged and ordered that instead. This is a nice place to stop if you want a quick, early dinner. Gorgeous pictures! I’m jealous! Beautiful Girls!